After snapping a seven-game winless streak against Alaska, the Wolverines came into this weekend against Sparty looking to put together a streak of a better kind. They came out with a 3-game unbeaten streak in tact. 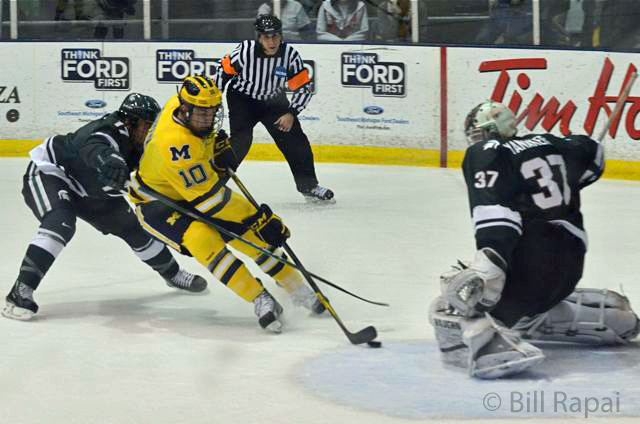 Michigan won 4-3 on Friday night at Yost before following it up with a 3-3 tie and losing in the shootout. All told, they came out of the weekend with four of six points. On Friday night, Michigan State came out with a good first shift, but it was the Wolverines who drew first blood. David Wohlberg absolutely sniped one up over Will Yanakeff's glove to make it 1-0 Wolverines. It was a good pass off the boards from Brown. Wohlberg came in, got into a shooting position, waited for Yanakeff to go down and then fired one up over his glove. Before the students could start their goal count, however, it was 1-1. Crandall took a shot from the point that must have deflected off of something. Hunwick just missed it and that's very unlike him. Some people were saying it got the stick of one of the Michigan players on the way through. Chris Brown was called for setting a little pick and Michigan killed the penalty off without too much trouble. When Brown came out of the box, he got the puck, got around the outside of the defenseman, cut to the net, and tucked it five-hole as he was going across the crease. Very, very nice goal out of Michigan's power forward. The period would end 2-1 Michigan thanks to some robbery by Shawn Hunwick. Michigan State took a shot from the point that went wide and out the other side. It went right to Forfar, who had nothing but an empty net to shoot at. He put it on goal, but Hunwick dove to his right and got the paddle down just in time. Early in the second, Sparks put one off the bar. Yanakeff then had a huge stop on PDG. Di Giuseppe just barely got a touch on a pass over to Treais. He gave it back to PDG and Yanakeff did the splits and just got a piece of the shot. Guptill then completed the "hat trick" for his line. A Spartan clearing attempt hit him. He then controlled it and cut to the net on his backhand. He lofted it up over Yanakeff's glove and it was 3-1. Kevin Lynch then made it 4-1. Derek DeBlois had a very nice feed from behind the net. Lynch got the shot off and Yanakeff got 95% of it. It snuck through behind him, but Lynch followed his shot and was able to tap it the rest of the way home before anyone else could react. A scrap in front of Hunwick resulted in Michigan State starting the third period on the power play. They got a goal and some much-needed momentum. The Wolverines failed to clear the puck a couple of times and Berry was able to get one past Hunwick after his initial shot was blocked. After Moffatt went for interference, the Spartans had another power play. Some nice efforts by Travis Lynch and Kevin Clare got the puck out, but on the next FYS rush Hunwick wrapped it around the boards but not out. A shot from the point went off the glass, came back over the net, and went off Hunwick and in. It may have had a little help from Darnell. So with 14 minutes left it was 4-3. PDG nearly connected with Treais for some insurance. He had a crafty little feed from behind the net. Treais's shot looked like it hit the post. The goal light went on, but the puck didn't go in. Clare had a very nice effort to break up a pass for a streaking Leveille. With Yanakeff on the bench, the Spartans had several chances to tie it, but Hunwick stood tall and Michigan got the win. The next night in East Lansing, Michigan got off to another good start, but couldn't quite finish the job. After an opening five minutes where nothing much happened, Chris Brown made it 1-0 good guys. Guptill stole the puck and fed him. Brown let a shot go, it snuck through Palmisano, and Brown was able to crash the net and knock in his own rebound. Treais had a chance on a 2-on-1 and might have gotten the post. Hunwick then ROBBED Darnell on a breakaway. Flashed the glove on that one. The Spartans tied it at 1 on a Krug shot from the point that deflected off Guptill's skate into the top corner. Absolutely no chance for Hunwick on that one. FYS then made it 2-1. Hunwick tried to dump the puck around the boards but it hit a Spartan player. He centered it for Forfar, and it was actually kind of fortunate that it wasn't a good pass. Hunwick slid to his right, Forfar kicked it back to his stick (to Hunwick's left) and that side of the net was wide open. Hunwick kept it at 2-1 by stoning Wolfe on a breakaway and then Moffatt tied it up at 2. The puck came out of a scrum and he kicked it up to his stick before backhanding one top-shelf. Nice goal. Michigan's goalie saved the day again with a couple of quick pad saves off a really ugly turnover in the Michigan end. Hyman darn near put the Wolverines ahead on a wrap-around, but couldn't quite stuff it in. The period ended with the score tied. In the third, both teams had early power plays without a whole lot of success. A little later Hunwick made a big stop on Perlini. Berry brought the puck to the middle of the ice and brought three guys with him. He dropped it back to an open Perlini and Hunwick stoned him. Wohlberg then made it 3-2 Michigan. Guptill took a shot, Palmisano made the save, but Wohlberg was there to bury the rebound to put Michigan ahead with 6 1/2 minutes to play. Then the abomination: Kevin Lynch got called for holding and I don't have the foggiest idea what the ref saw. He checked the Spartan player very awkwardly, but he was falling at the time and kind of hit him with his back. His hands and arms were completely away from the FYS player. Just a completely inexcusable call at that point in the game, especially since they had let almost everything go to that point. And of course bad calls are amplified when you can't kill a penalty to save your life. Michigan almost pulled it off. DeBlois did a lot of great work to run the penalty clock down inside 30 seconds. Moffie tried to clear the zone on his backhand and partially fanned. The puck went right up the middle to Reimer, who roofed one over Hunwick. Michigan appeared to be headed to the power play with under a minute to go, but right as the whistle was going, Chris Brown lifted a guy's stick and pushed him. Clearly that warranted evening it up. Le sigh. Michigan had a couple of chances in the overtime and actually outshot the Spartans 8-0 but it went to a shootout. Wohlberg, Brown, and Treais missed for the Wolverines. Berry was able to get a backhander over Hunwick's stick and that was all she wrote. Michigan came out of the weekend with 4 points. Overall I thought it was a pretty good weekend. Hunwick played well, the defense overall played pretty well, the top line was dominant (Guptill was named Rookie of the Week, and the trio combined for 5 goals on the weekend), they got some pucks past Yanakeff who had previously owned them. I also thought that Zach Hyman looked really good on Saturday night. I know he hasn't done as much offensively as we all probably expected, but in two of the three games I've seen I thought he played really well. Once Travis Lynch went out with an injury, Red moved him up to the second line and I thought he was one of Michigan's best players. He had several pretty good scoring chances, and made a really nice defensive play to break up a pass for Walrod that would've been a beautiful scoring chance. Like I said, I've only seen three games this year so I didn't see the bad, but I don't get the impression that they're too far off. Michigan State had been playing really good hockey, and the Wolverines darn near swept them, even without their two best skaters on Saturday night. There are some big problems on the penalty kill, which wasn't entirely unexpected given that Michigan turned over pretty much the entire PK from last year. There are also some problems in their own end getting the puck out. Having Jon Merrill come back at some point (hopefully) should be a big help in that regard. Even as bad as the 7-game winless streak was, Michigan currently sits 17th in the Pairwise, so they're just outside the NCAA Tournament. They've been doing it with their best player missing the entire season thusfar. I wouldn't write this team off just yet. They seem like they're getting it together.